At NextView, my partners and I deliberately follow a sort of map for the consumer side of our investing. The strategy for what amounts to half of our portfolio is relatively simple: follow the dollars. 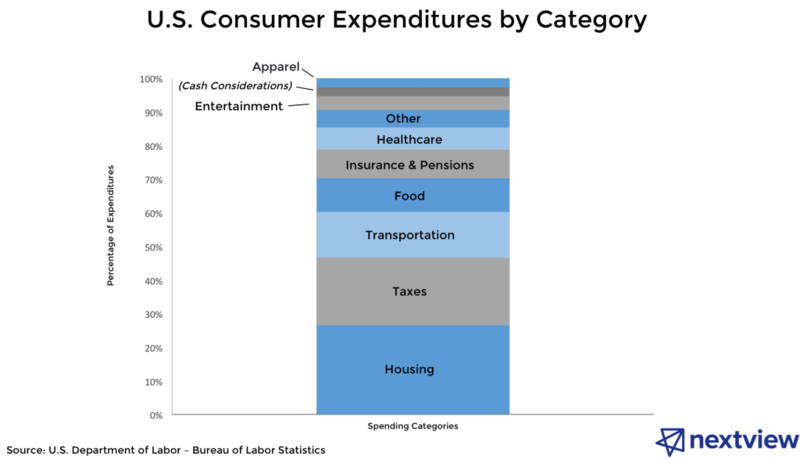 As a starting point, we use the macroeconomic data of U.S Consumer Expenditures as a pseudo-treasure map to pinpoint opportunities for large, meaningful disruption by startups. The concluding thought is equally simple but crucial: a startup’s ability to have a dramatic impact increases when they focus on an area where consumers spend the greatest proportion of their income. 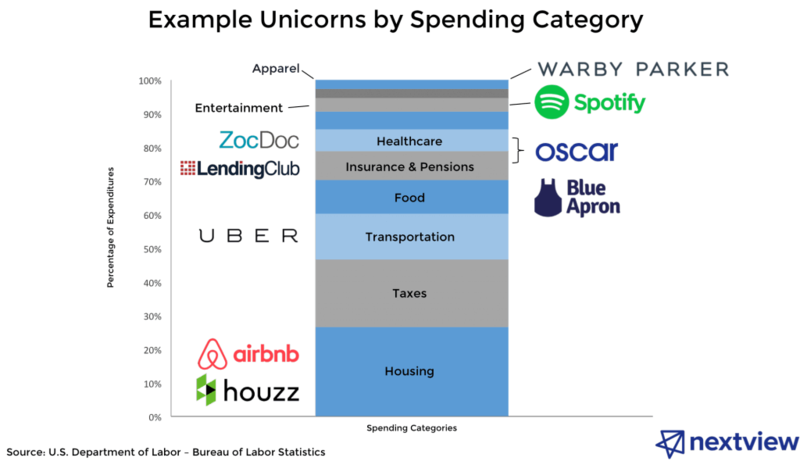 Following this logic, it should be no surprise that two of the most valuable startups on the planet, Uber and Airbnb, can be categorized in the two largest consumer spending categories, transportation and housing. And these are just two examples of a much longer list. So that’s the context, but more importantly: What does this approach mean for those in the startup ecosystem? For VCs, there has been a trend over the past few years towards not merely investing in underlying technology itself but also into technology-enabled services and goods empowered by it. This recognition has opened up categories for venture-backed consumer startups beyond just categories like entertainment. Disrupting markets like food, insurance, or transportation wouldn’t have been on most VCs list a decade ago. Given that they are now, it’s important to recognize that, because of their scale, these are certainly not winner-take-all scenarios. They’re just too big, so there is room for multiple “bets” in each top-level category. Another important lesson for anyone in the tech ecosystem — founders, investors, operators, journalists, etc. — is that these giant consumer spending categories are not always disrupted head on (i.e., from within). Rather, it’s that disruption most often comes from the side. This manifests through new business models and entrepreneurs with blank canvas thinking entering these markets. Uber is a great example in transportation: The way in which they’re disrupting the market is much different than Tesla or Google. While I\wouldn’t bet against the latter two (they’re both still disrupting the category), Uber is appealing in part because they were able to rise quickly and gain near ubiquity thanks largely because they didn’t emerge with the same business model as the existing car manufacturer competitor set. (So it’s no surprise that we’ve seen a rush of “Uber for X” startups — that from-the-side disruption can more obviously apply to other categories, whereas it’s much harder to simply copy Tesla’s model elsewhere, given their attack is more head-on in transportation.) In the same vein of side disruption, Blue Apron is neither a grocery store nor a restaurant, but an offering uniquely different. To cite our own strategy as the example: We’re not approaching a category like housing by trying to invest in, say, a single marketplace for all of housing. Instead, we’ve made multiple investments into the flow of consumer expenditures in the same category. This has led us to partner with entrepreneurs building companies like Paintzen (marketplace for painting jobs) and Renoviso (small home renovations). Even with network effects, these markets are so large that they’re not going to be dominated by one single player, so we’re continually looking for multiple opportunities in each segment. In the current environment, non-financial metric growth can often take center stage. But, ultimately, it’s important to remember that the investors in today’s unicorns and other large, standalone startups will eventually say, “Show me the money.” Some will deliver, others won’t, but the fact remains: If you’re a smart entrepreneur or investor today, you should already know where to look. Want to research consumer startups? 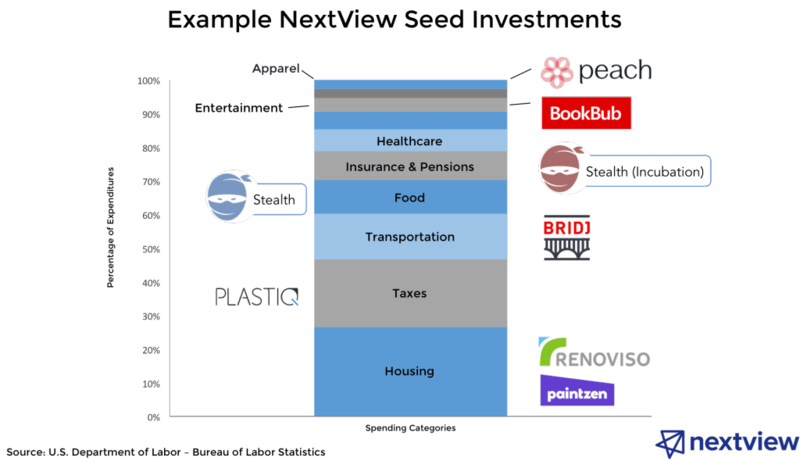 This is a guest post by David Beisel, co-founder and partner at NextView You can reach him on Twitter or via the NextView blog about startup traction.